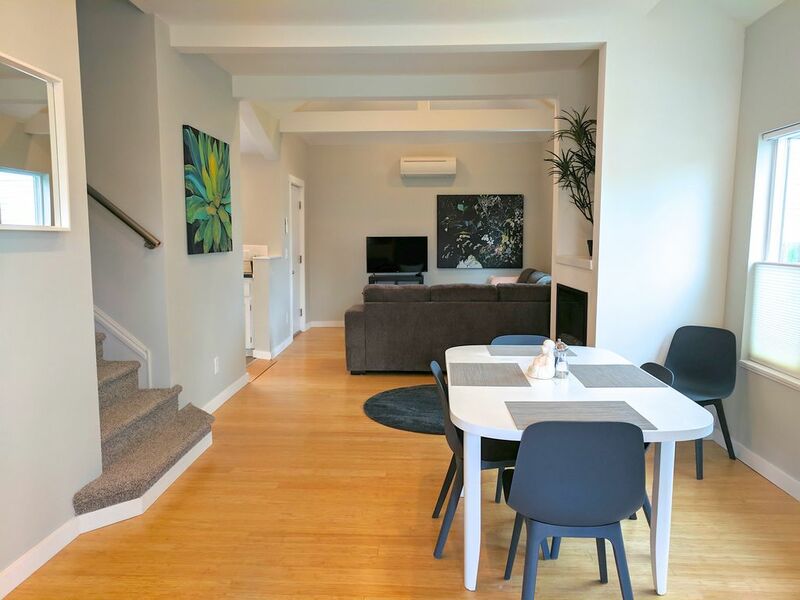 Large and bright 2 bed / 1 bath home in a beautifully renovated duplex, one block from Portland's "Restaurant Row". First floor has open-concept living and dining area with bamboo floors and vaulted ceiling, plus galley kitchen with laundry station. Second floor has two huge bedrooms and full bathroom with two sinks. Large windows and skylights throughout! This unit is the largest portion of a duplex, and has exclusive use of the driveway, big grassy yard, and back patio. The house is on a corner lot across the street from a community garden and park. Each bedroom has a queen-size bed, and there's a sleeper sectional in the living room. This place is ideal for 2-4 guests, and can accommodate up to 5. All sleeping areas have direct access to the bathroom. Please note that there are stairs in this unit, including some funky stairs between rooms on the second floor. Although we've added handrails and stair lights for safety, we don't recommend this space for elderly or disabled folks, or very young children. Pets are not allowed! This unit has its own private access with a shared porch. It has a digital lock with a keypad code entry, so you can arrive worry free, any time day or night. There is a dedicated driveway that fits up to two cars, and on-street parking is typically available right in front of the house. This duplex is located in Kerns, a friendly, safe neighborhood in close-in East Portland. You can't beat the location! One block from "Restaurant Row" with many fabulous restaurants plus shops, coffee, barber/salon, convenience stores, dry cleaners, Laurelhurst Theatre, Whole Foods, Starbucks - basically anything you need is mere steps away. You could easily stay on foot here, but venturing out further is easy as well! Downtown Portland is 10 mins by car, 15 mins by bike, or 20 mins by bus. Close to multiple bus lines as well as Nike Biketown rental bikes, you don't need a car to get around, but car2go, Zipcar, Uber, Lyft, and traditional taxis are all available, plus Enterprise Rent-A-Car is a 6-block walk away. I grew up in the SE and now call the NW my home. I'm a busy bee working in Portland's up-and-coming tech industry. I love exploring, learning, and meeting new people from all walks of life. There's a manual coffee bean grinder, a french press, a ceramic pour-over cone + paper filters, and a Keurig single-cup coffee maker + stainless steel reusable K-cups. Bring your own coffee! There are steps up to the entrance, as well as stairs within the unit. This is the first VRBO that has actually been better than the pictures. Right down to sharp knives in the kitchen. Thoughtful layout and truly has everything a guest needs. Thanks Megan. The unit was very clean and well equipped. Would definitely recommend. We had a great stay at this property. We loved the easy keyless entry (no problems at all gaining entry, the system was updated) and the fabulous location. The restaurants and shops were great! It's very centrally located too so you're about 10-15 minutes from most places. Inside, you won't be disappointed. The house is wonderfully clean and well-stocked with practical items. The heaters work well too! Megan was very responsive to the few questions that we had as well. Thank you, Megan! We hope to stay here again! This place is as clean and bright as described and pictured. It has all amenities in the kitchen and bath. The bonus is definitely the location for those unfamiliar with the city. The friendly neighborhood is very walkable to all your needs like cafes, restaurants, bars, music venues, groceries and shopping. We had a car and you could drive across the river to the downtown area and be parked in less than 15 minutes. The access to the highways to go to the state parks and other tourist sights was usually less than 10 minutes to the on ramp even with traffic. We enjoyed having the in-house washer/dryer and the dedicated parking in the driveway. The only small con I would say is the app for the deadlocks. Although it's great not to have to exchange keys the app used for the locks was frustrating. Sometimes we had to wait several minutes for the app to connect with locks and sometimes the lock did not unlock even though you could hear it trying to unlock. Could have been phone issues, I guess. Anyway, we weren't put off by this because we knew the owners to be very responsive. I would recommend this rental. The price is appropriate for the condition, quality and convenience. Thank you for your review, Sharon! It was a pleasure to host you guys. Your feedback on the lock is appreciated, and I wanted to note that we're already in the process of replacing it with a different one! Apologies for the frustration, and I'm glad you enjoyed your stay. This property is exceptional. The recently renovated house in an older neighborhood is absolutely perfect for staying in Portland. The Kerns neighborhood is so much fun. It has great local pubs and little restaurants to fit anyone needs with their top notch laid back friendly approach is exactly how service should be done. Highly recommend anyone who wants to see Portland for what Portland is. The people here are friendly and fun to be around,I can not say enough about how super Portland and this area is !! Our family of four had the perfect week at the house. The location and cleanliness were unbeatable.